Listeners of KFAN in Minneapolis will be familiar with “The Common Man” Dan Cole. For everyone else, he’s a radio DJ with a sports talk show from noon to 3pm weekdays. One of Dan Cole’s running jokes, of which there are many, involves the numbers 13 and 14. Often when he comes back from commercial he will say it is 13-14 after the hour even though it may be 1:30pm. He might also say that a particular athlete is making 13-14 million dollars and should play through a minor injury like bi-lateral leg weakness (we’re looking at you MN Twins former catcher and current 1st baseman Joe Mauer). It’s dumb but it stands out and his listeners follow the bit. Anyway, The Common Man Edition of Fun With Maps will be all about the wealth. Why? Because I leave for vacation in a week and this vague connection between the common man and the exact opposite makes sense to me. What? I’m tired and have vacation on the brain! Whatever. Maps to follow. 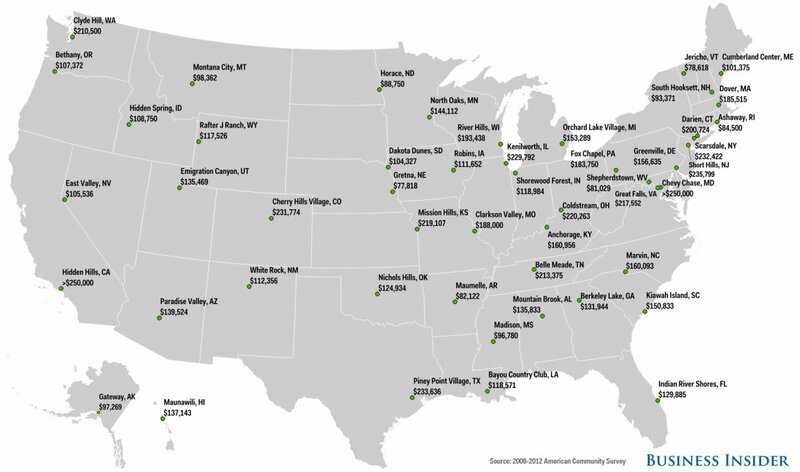 Map 13 shows the wealthiest towns in each of the fifty states. The information and image come from a yahoo article that claims the figures were taken between 2008 and 2012 in a survey of towns over 1000 residents. The towns pictured supposedly have the highest median household income in each state. I’ve never heard of North Oaks, MN except I think they have a golf course of the same name. You can head on over to the website for North Oaks (http://www.cityofnorthoaks.com/) if you’d like to move there to bring the median income way down. For all of these towns I bet they don’t have a lot of problems funding the local schools and emergency services through referendums. If you have a kid that needs to sell popcorn or cookies or something for school or scouts, head that direction. Map 14 shows each state with the name of the richest resident. Again I found myself not terribly aware of the rich-set of my home state Minnesota. Apparently Whitney MacMillan is the great-grandson of the founder of Cargill, William W. Cargill. He served as CEO for 19 years and now probably golfs a lot. I cannot imagine what it would be like to have a net worth of almost five billion dollars. I’m sure he gets all of the special sports channels on dish/cable and has no problem finding helicopter parking. This map is also interesting because there are few people you may have heard of included. Bill Gates ($76 Billion) and Warren Buffett ($58 Billion) are pretty famous for their business acumen, the Koch brothers each represent a state ($40 Billion each), and a couple of Wal-Mart kids rule Arkansas, Texas and Wyoming ($34-36 Billion each). 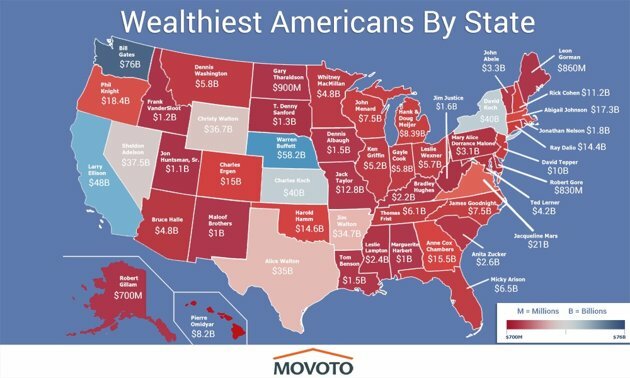 Any billionaire could represent several states if this chart counted homes in multiple states. Warren Buffett probably owns property directly in 10+ states (and in all of them if you count the corporations he is involved with). Damn it I am poor! Well now you know where to move or whom to pester with your charity invitations. Lots of money up there. I can’t say I wouldn’t accept funding to research this further, hint hint.